I make this cake for my son’s birth day. He is star wars collector. So I wanted to make a real outstanding cake that make his eyes blink and his moutn wide open. But I didn’t have an idea of what to do. I went to bed and thats how the idea came to my dream. I wake up ready to bake. For the beginning it took me a while to think haw to bake and how to build the cake but once it was ready on the oven. Give me time to watch the movie and play with R2-D2 for a while, taking a good look of the details. I bake 4 cakes to make my R2 the 2nd floor was chocolate my son’s favorite! I make the cake during the early morning so when he woke up the cake was ready and hidden. I left with his father to the park to decorate and when I got there with the cake, not just my kid was surprised all the people in the park followed me to the table to see if its was really a cake. My sons face was a million dollar cake. 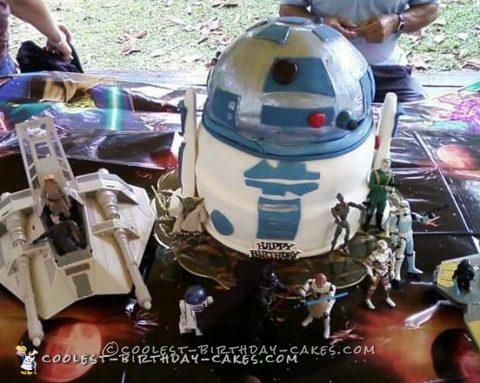 Everybody took R2 head off to eat the chocolate cake first and thats how I have my dreamed cake…Enjoy. Wauuuu its really a dream cake. Congratts!!! that day because is was a really surprise and an amazing cake.